Mitigation planning saves lives and property, speeds recovery following disasters, and expedites both pre-disaster and post-disaster grant funding. Developing a hazard mitigation plan is requirement for any local government who wants to apply for mitigation grant funds. 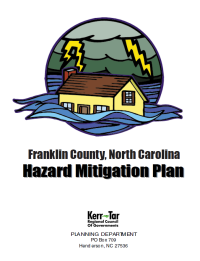 Franklin County submits a Hazard Mitigation Plan in cooperation with all local municipalities every five years to the North Carolina Department of Public Safety. The county is scheduled to submit an updated plan in 2015.